Millennium Falcon With Real Spice In It | OhGizmo! By Jonathan Kimak on 07/17/08 • Leave a comment! 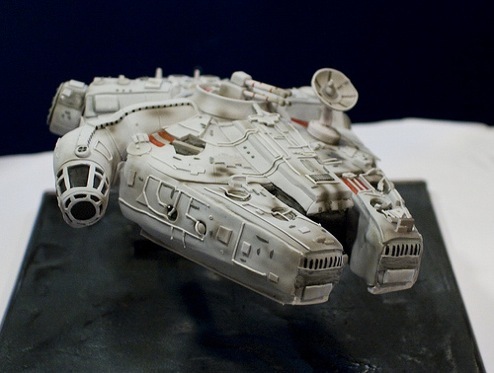 Does that Millennium Falcon look like the latest and greatest highly detailed collectible? Because this one would have to stay in your freezer to stay good, because it’s a cake. It was created by Charm City Cakes in Baltimore, owned by Duff Goldman . Sys admin Michael Biven , who will now be known as one of the greatest brothers a guy could have, suprised his brother Brian with this birthday cake this past weekend. The cake will also be part of an episode of Ace of Cakes on the food network in September. And if you’re in the Baltimore area and want an awesome cake you should consider Charm City Cakes (they’ve also made a Star Destroyer and Deathstar cake).